Galileo's famous experiment reincarnated in a Wolfram Demonstration. Ever since discovering them in my first year of college, I've been a frequent visitor to Stephen Wolfram's MathWorld and ScienceWorld. Those websites were great for when, far from my textbook, I needed to remember the value of a physical constant or what the heck Green's function does. Occasionally, the Mathematica Integrator helped smooth out a thorny integral. But they were more references than textbooks, better for jogging my memory than teaching me something new. So I was pretty excited to see a new Wolfram webpage: Wolfram demonstrations. After downloading (for free) Mathematica Player, you can open up any number of demonstrations in subjects ranging from pure math to biology to high school physics. I was excited; I sort of love Java applets that illustrate physics concepts, and the Wolfram demonstrations page was just so colorful and full. Galileo's gravity experiments? Archimedes' principle? 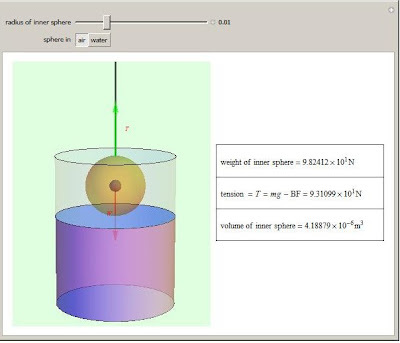 Not even deterred by the required online form, I signed up for my free copy of Mathematica Player and happily downloaded the demonstration of Galileo's fabled experiment of dropping balls from the top of the Tower of Pisa. 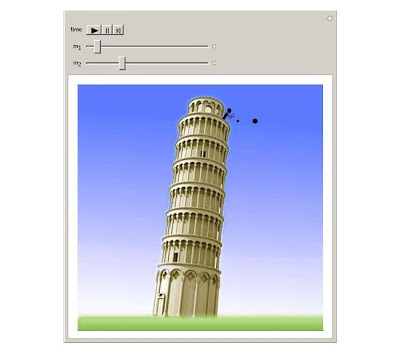 The applet showed a computer-graphic-cute Tower of Pisa, tilted over a grassy plain on a sunny day. A stick figure leaning out a top story window was holding two balls, whose masses I could change by moving a slider. I pressed play. The two balls started to fall, accelerating rather jerkily until their black pixels met the green pixels of grass at the bottom of the tower at—big surprise—exactly the same time. It was then that I realized there was something fundamentally wrong with the idea of trying to show people this simple concept, that acceleration of a body due to gravity is not dependent on its mass, with a computer program. First of all, it's very intuitive to us that heavier things should fall faster. It just seems like it should be true, no matter how many times you've been told it isn't, right? Hold a bowling ball and a golf ball at the same height, and it just seems impossible that the golf ball will hit the ground at the same time. That's why replicating the experiment (it's debatable whether Galileo actually did it in the first place) is so much fun. Physics is surprising and counterintuitive, so seeing it at work in nature is very compelling. Only experiments can make the connection between the acceleration calculated from the equation for the gravitational attraction between two objects and an actual falling object. Unfortunately, there is nothing compelling about a computer-generated movie that shows this. You're not going to convince any kids with this demonstration. Far more compelling would be dropping, say, a computer mouse and a CPU tower from a high window. A Wolfram demo takes the excitement out of Archimedes' classic experiment. Still, I'm a bit of a fan of Stephen Wolfram (anyone who tried to write a particle physics textbook at the age of twelve is sort of hard to hate) and I wanted to like this new project, so I opened up a demo that purported to reenact the experiment Archimedes carried out as a result of his bathtub "Eureka!" moment. This is a great story from the birth of science—Archimedes was charged with figuring out if a crown the king had commissioned for a temple was really pure gold. By comparing how much water the crown displaced to how much gold of the same mass displaced, he showed that the crown was not pure gold—the crown displaced a greater volume of water than the equivalent mass of gold, meaning it was greater in volume than it should have been. It had padded with a less dense metal (silver) to make the masses match. Too bad for the crown-maker. Archimedes’ Principle states that the buoyancy support force is exactly equal to the weight of the water displaced by the crown, that is, it is equal to the weight of a volume of water equal to the volume of the crown. The Wolfram demo of this experiment is somewhat interesting visually but not enlightening in the slightest. (I even suspect that the way the author has reworked the experiment makes the whole thing trivial, but I won't get into that here, though it brings up the question how trustworthy these are as teaching resources.) Now here's an opportunity for a physicist-in-training to splash water around and relive quite a dramatic tale from Greek history. A sacred temple, a golden treasure, a treasonous betrayal—this physics experiment has it all! Seeing numbers change on a screen doesn't really do it for me, and I already know what I'm supposed to be looking for. 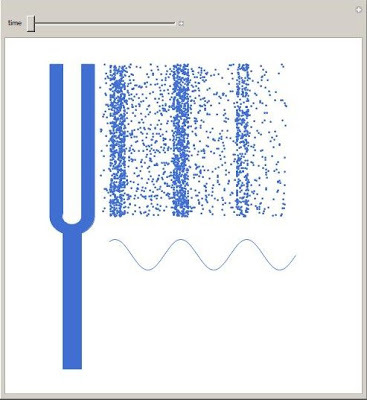 A Wolfram demonstration shows the compression wave in air created by a tuning fork. True, these were only two of hundreds of demos available. A tuning fork one wasn't so bad—it lets you see air particles rarefy and compress. Compression waves are &mdsah;tough to visualize, and this makes it explicit. But you can't change the loudness of the tuning fork, or its frequency. And what about harmonics? Again, it would be more instructive to have a real tuning fork you could bang and listen to and feel. But maybe that's because I've been reading High Tech Heretic an indictment of our enthusiasm for allotting greater and greater portions of school budgets to buying computers and hooking up high-speed internet. Believe it or not, the author isn't living in a cave, or in Amish country. Clifford Stoll, an astronomer who makes topological drinkware in his spare time, has been "digital" since the 70s. While working at Lawrence Berkeley National Lab in the 80s, he detected and relentlessly tracked down a KGB hacker who was popping in and out of networked computers on military bases around the country. Wait, and this guy doesn't want computers in the classroom? Is this a grudge? My knee-jerk reaction is to think that more computers in schools means greater, easier access to information. But Stoll's book points out that, first of all, schools' budgets are limited; is it really worth it to spend tens of thousands of dollars on equipment that's obsolete in two years or less, when that money could be invested into longer-lasting resources, like better libraries and talented teachers? Many proponents of computers in the classroom claim that computers can save costs by replacing laboratories, largely thanks to programs that demonstrate chemical, biological, or physical concepts—Wolfram demonstrations, for example. No toxic chemicals, no cow eyes, no costly beakers and scales—students can instead explore scientific concepts in a virtual environment. Right? What about science? Well, Professor Turkels' seven-year-old daughter was curious about magnets. The girl had a computer program about magnets but didn't really understand them. Then Professor Turkel bought a magnet for her daughter. "Once she was holding it in her hands, she got it." School chemistry software comes complete with pretty images of thermometers, pipettes, and condensers. To simulate a titration, you type in commands, use a mouse to drag a simulated beaker across the screen, and then watch the effect on a simulated pH meter. Sure looks spiffy, but it ain't chemistry. It's simulated chemistry. The demonstrations I found on Wolfram's site were disappointing for the same reason. It's hard to be interested in physics in a virtual world. To build these demonstrations, people took rules already extracted from nature and used them to construct a simple, boring, perfect version of nature. The more kids learn physics from computers, the harder it will be for them to actually understand that physics doesn't just exist in computer simulations in math. It governs the world of cars and people, flowers and ants, towers and bathtubs. No computer can teach that.